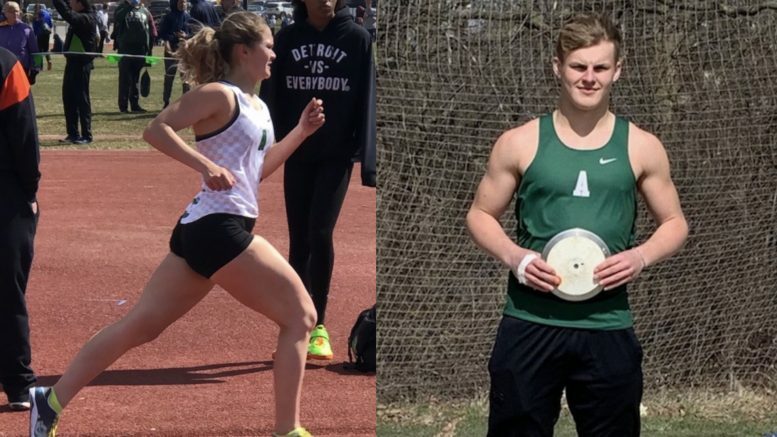 Alpena's Maddy Boyd (3200 M) and Eli Winter (discus) break school track records. Junior Eli Winter led the way with a school record toss of 170’ 1” in discus taking first place. He currently sits second overall in the state. Other first place finishes include Michigan State signee Josh Smith in the 800 (2:01.05), Haydn Goebel in the 110 hurdles (16.59), Gabe Bullis in pole vault (14’ 9”) and the 4×800 meter relay (8:13.9) of Drew Seabase, Jacob Kochanski, Aden Smith and Josh Smith. Second place finishers were Haydn Goebel in High Jump (5’9”), Eli Winter in shot put (48’5”), Drew Seabase in the 800 (2:01.7), Josh Smith 1600 (4:30.2), Spartan signee Aden Smith 3200 (9:58.7) and Haydn Goebel 110 hurdles (43.38). 3rd Place finishers were Detroit Mercy commit Zach Zaborney for 300 meter hurdles (44.78), Caleb Zaborney in high jump (5’6”), Josiah Matuzak in pole vault (11’) and Zack Zaborney in long jump (20’ 3.75”). Fourth place runners were Drew Seabase 1600 (4:44.6), Zach Zaborney 110 hurdles (44.78) and the 4×200 meter relay (1:38.74) of Kody Bertrand, Dylan Fleck, Cooper Bright, and Robert Sheldon. The Wildcats travel to Traverse City Central on Tuesday, April 16th.